Shadows, one of my favorite things on Earth. There’s been a lot of stories about shadows and it’s surprising that I have only created a single poem about it and a very short one at that. Probably because my fascination with shadows give me joy, unlike the melancholic feeling I get with the rain, sun, or moon. And when you’re happy you rarely think of anything else, you just smile and take the moment in. P.S. I have more shadow pictures but it seems like I’m only fascinated with my shadow lol. For two consecutive years, the top post of my blog remains the same: Unconscious Love. While I see no problem in that, it’s a little troubling to think how people led them there: by searching ‘sad couple’ on the internet. The featured photo I used for the post is simply named ‘sad couple’ and mistakenly linking it to the source didn’t prevent it from getting the attention it currently enjoys. One look at my search engine stats and you’ll think that there’s a lot of people who are sad, as the top fifteen searches managed to have the word ‘sad’ in it. But then again most of my posts have a hint of sadness, so it’s no wonder I’m attracting all the brokenhearted, miserable, rejected, unhappy ones and all the synonyms of a sad person you can think of. Yes, it’s a little troubling that all these people are sad, but sadness is an emotion and emotions don’t last, they constantly change and shape us to become the person we are supposed to be. I only hope that, through my blog, people will realize they are not alone in this world, that someone from another country shares the same pain they have, and that we will all get through, always. We are not capable of loving someone unconsciously. We feel it; we are aware when it’s starting to grow in our hearts and mess with our mind and our life in general. We know it coz we start to look at someone in a very special (and weird) way. We simply recognize love and all of us are conscious when it comes to it. Because love just is. This is in response to the blog event Writer’s Quote Wednesday. Empty, that’s being nothing, feeling nothing. Reading the quote above though makes me wanna believe that the emptiness we feel from time to time doesn’t go to waste. If we leave traces of ourselves in everything we love, then feeling empty is worth it. 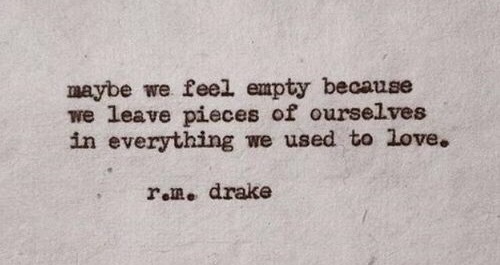 But that’s not to say that being empty is okay. For if we really leave traces of ourselves to those we love, then we also get traces from those that love us. And if that’s the case, which I’d like to believe it is, then no one will ever be empty for a long time. We just need to learn how to accept the pieces from the others, and how to give our pieces only to those who deserve them. This is in response to the blog event Writer’s Quote Wednesday and Daily Post’s prompt Empty. Ideas, projects, dreams, feelings. I have countless of those, and many more things. We all have, that sometimes we get all too caught up we forget to focus on one aspect of our lives at a time. We wanted to do, to finish, a lot of things on the same day, to be as productive as much as we can, but it’s only reducing the quality of what we’re doing. It’s breaking our creativeness and our energy into parts, trying to fill in all holes without much deliberation, without considering that putting your heart out or focusing on one will give you only the best result, if not perfect. We’re trying too hard, writing down all our ideas for a project that might never be because you thought of a better one, setting aside the previous idea and the rest before that. We dream a lot, and even though there’s nothing wrong with that, there’s nothing right that we do to achieve it either, we just let them be our dreams when we can actually pick the one we like most and start working our butts off for it to be our reality. And sometimes, we want to feel too much, we demand more from ourselves (and the others) what we know all of us can never give, which just makes us sad—the one feeling we don’t want. So without much deliberation I wrote this, to feel sorry for myself—for trying too hard, for dreaming a lot, and for wanting to feel more. And in case you found yourself in my shoes, maybe we can stop for a moment and start to deliberate our lives. When I read the daily prompt, I easily remembered this certain photo and the caption it has. Now when I see this, I think of the happy moment from when my workmates and I were just having fun and making #hugot (I highly suggest you click the link to find out). The caption was just the first two sentences of a beautiful prose poetry by Chris. And don’t worry, for I already thanked him for that.